REUTERS — A Malaysia Airlines flight carrying 227 passengers and 12 crew from Kuala Lumpur to Beijing went missing over the south Viet Nam Sea on Saturday, prompting China to send ships to scour the water for possible wreckage. Flight MH370, operating a Boeing 777-200ER aircraft, last had contact with air traffic controllers 120 nautical miles off the east coast of the Malaysian town of Kota Bharu, Malaysia Airlines chief executive Ahmad Jauhari Yahya said in a statement read to the news conference in Kuala Lumpur. "We are extremely worried," Chinese Foreign Minister Wang Yi told reporters in Beijing. "The news is very disturbing. We hope everyone on the plane is safe." An official at the Civil Aviation Authority of Vietnam (CAAV) said the plane had failed to check in as scheduled at 1721 GMT while it was flying over the sea between Malaysia and Ho Chi Minh City. The Boeing 777-200ER has a range of 14,305 km (7,725 miles). While the fate of flight MH370 remains unclear, flight tracking website flightaware.com showed that it flew northeast over Malaysia after takeoff and climbed to an altitude of 35,000 feet. The flight vanished from the website's tracking records a minute later while it was still climbing. If it has crashed, the United States could have a role in any investigation because the plane was built there, said Kelly Nantel, a spokeswoman for the U.S. National Transportation Safety Board. "We won't know who would lead the investigation until the location is identified," she said. Chinese and Vietnamese media reported that an unspecified signal had been picked up from the plane near Cape Ca Mau, 250 km (155 miles) southwest of Ho Chi Minh city, but a Vietnamese maritime search and rescue official said that was not true. "We have been seeking but no signal from the plane yet," Pham Hien, director of a Vietnam maritime search and rescue coordination center in Vung Tau, told Reuters by telephone. 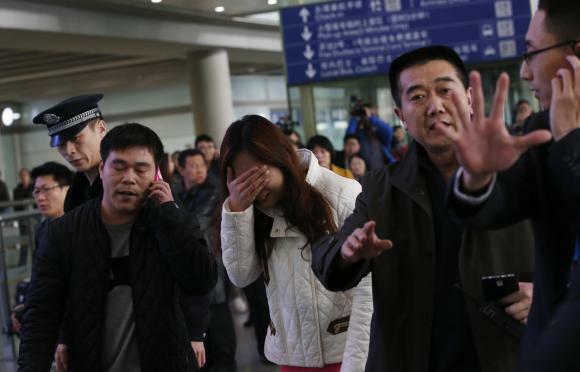 China's aviation regulators said they had not received any signals from the plane and that there had been no reports of any aircraft crashing in Chinese waters. Malaysia Airlines said it was contacting the families of those on board flight MH370 and had set up support facilities. Chang Ken Fei, a Malaysian waiting at Beijing airport for friends to arrive, said: "I got here at seven (a.m.). At first I thought the plane was just delayed as normal, so I came a bit later, I've just been waiting and waiting."